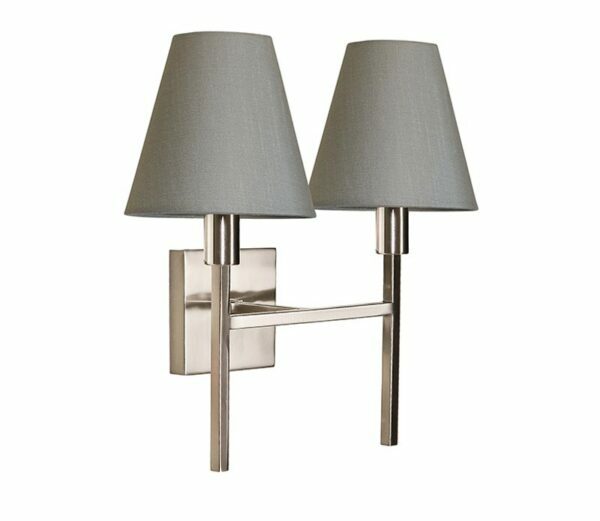 This Elstead Lucerne double wall light in brushed nickel finish with grey shades is sleek and contemporary. Featuring a square wall mount, ‘T’ bar arm and upright square bar stems, with bright nickel lamp holders and grey cone shades. Ideal for a bright and airy dining room, hallway, bedroom or living room wall. This modern design is supplied by Elstead Lighting, a British company that specialise in the manufacture and distribution of quality decorative lighting such as the Lucerne double wall light in brushed nickel finish with grey shades you see here.